Editor’s note: This Hangouts on Air video was edited due to connectivity issues on the part of Brian Jackson. Nicole Arbour’s connection was fabulous, naturally. And that’s no small compliment when you consider that Arbour is no stranger to performance. She’s appeared on numerous stages ranging from dance as the captain of the Canadian All-Star Dance Team; fashion runways as a model for major retail brands; music as a solo artist (you can watch her single Bang Bang on Youtube), and on broadcast television. Yet YouTube is where Arbour feels most comfortable. The numbers show it. At more than 43,000 subscribers and 2.6 million views and counting for her YouTube channel, Arbour has been building up her following on the platform since 2006. She’s also collaborated with major brands such as Molson Canadian and Virgin Mobile in Canada on video content, and become a bit of an ambassador for YouTube, having recently been featured on a panel during a workshop hosted by Google on how small businesses can get the most out of YouTube. We spoke with Arbour via Hangouts on Air (naturally) about her success on YouTube. Here’s a few tips that Arbour shared with us to make the most out of your video content – be sure to watch the video to hear more. In the world of stand-up comedy, Arbour was used to the set-up, punch flow of presenting a narrative to the audience. It’s a method that she’s brought over to her YouTube videos, creating a sort of MTV-style of editing together short clips into a longer piece. Arbour says its a good way to make sure your audience isn’t getting bored, and helps them keep focus on what they’re watching. YouTube will automatically choose a thumbnail for your video, but don’t just settle on that, Arbour says. The little image should cue your viewers as to what the video content will be about. It’s as simple as showing people what will be in the video, Arbour says. 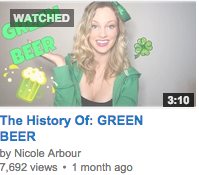 For example, her History of Green Beer video uses a thumbnail with arbour dressed in greenand a cartoon beer alongside a clover (for St. Patrick’s Day). Although YouTubers are split on whether text in a thumbnail is the right way to go, Arbour likes to have a title in hers. Arbour says that she likes to use her own Youtube channel to experiment as a place to “throw everything at the wall and see what sticks.” When something does stick and she sees it’s being watched and commented on, she returns to the idea and makes a sequel video, or even a series of videos. For example, Arbour has started making her “History of…” videos every Tuesday and taking fan suggestions as to what topic she should cover next. It’s a great way to encourage your audience to subscribe to your channel and return to it multiple times. Brightlane Entrepreneur Awards: The finals!